This inviting ranch home located in the award-winning Anchorage School District is full of charm. With many stylish updates and renovations throughout and the addition of a master suite, the living areas maintain the architectural character of the home with today's desired finishes. With 4 bedrooms and 3 full baths set on 1.7 acres of land in Anchorage, this home is very desirable. The kitchen, so full of character, has a fireplace that opens to a breakfast area and overlooks the mature landscaping in the backyard. A custom bar was built with beautiful cabinetry. The dining room is large and able to handle a crowd for entertaining and flows into a handsome family room with gorgeous windows and built-in bookshelves. The Master Suite was recently added and features a separate sitting area with a large closet, gorgeous master bath with double sink and marble oversized shower. Off the bath is an additional room that would make a lovely office or craft room. 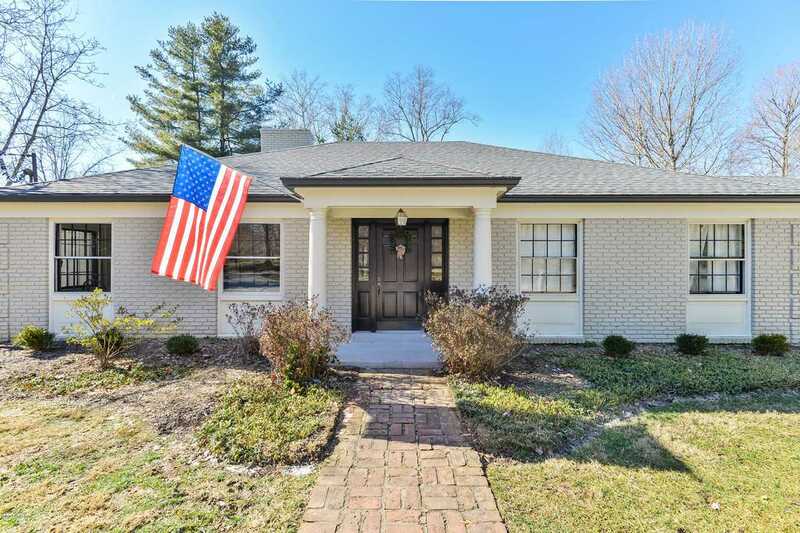 Three additional updated bedrooms and 2 newly remodeled full baths complete the first floor. The lower level unfinished basement offers a laundry area and abundant storage. Outdoors, enjoy living at its best on a large private patio area that includes multiple seating areas, a grilling station, and is surrounded by 1.7 acres of nature. The property also has a covered cabana with an outdoor fireplace that is perfect for entertaining year round. There is a new roof and gutters 2019. Nestled in the heart of Anchorage it is within minutes walking distance to the school, the local trail, and the city center. This home provides easy living in a special community. SchoolsClick map icons below to view information for schools near 1504 Cold Springs Rd Anchorage, KY 40223.